Aitor Pastor Sánchez, born in Valdecaballeros, Badajoz, completed his undergraduate studies in Physical Activity and Sports Sciences with highest honors at the University Camilo José Cela, subsequently complementing these studies with a Degree in Physiotherapy at the same university, consolidating his academic training with a Diploma in Physical Education. His professional activity has always been focused on the health-sports sector, developing his deep knowledge as a professional football player and simultaneously coach in the same sport in junior posts for both Real Madrid and Athletic Madrid; later he acted as personal trainer and physical therapist in renowned institutions such as Banco Santander Financial City. His additional experience is as extensive as his academic, with expertise ranging from Pilates to bodybuilding, weight-training and fitness, as well as his knowledge gained at the Ferran Adrià School of sports and nutrition, nowadays knowledge of fundamental importance. 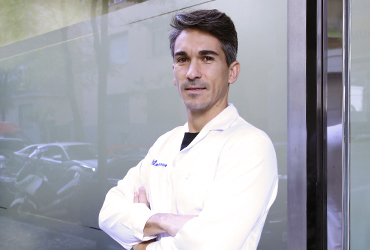 In Solcot, Aitor Pastor uses his expertise to ensure patients enjoy a quick and satisfactory evolution of their pathology, be it with treatments that start at the hospital after surgery, at home or in our rehabilitation center.